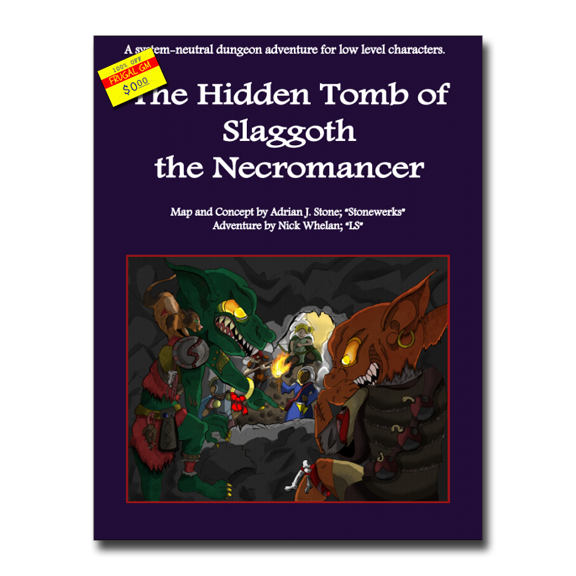 This week's Free GM Resource is an adventure that's been out for a while, but I only found out about it.....actually I don't know when I saved this link. The Hidden Tomb of Slaggoth the Necromancer comes from a nearly two-year-old posting on the Papers & Pencils blog. The blog is a treasure trove of tidbits you might find useful, so I'd poke around a bit. I's say the Hidden Tomb is a 3-5ish adventure, but it isn't statted as such, or really statted specifically at all. Some of the artwork could have been processed better and I wish some break out text wasn't in a dark grey box, but overall a real nice 1st effort that is far better than my first couple years of adventure writing for sure. You should check out the blog and the adventure today!